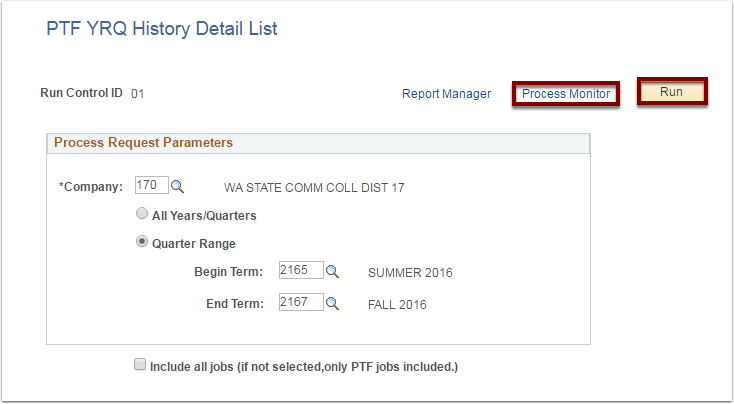 Purpose: Use this document as a reference for using the custom reports for part time faculty benefits information in ctcLink. NOTE: This report will total all FWL FTE’s from both Job and FWL to generate one totaled FTE. Any jobs in Job Data that have an EMPL CLASS of Part Time Faculty will not be considered for Job purposes (as they are being taken from FWL), but any other Job Data that contains an EMPL CLASS outside of that will be added in. 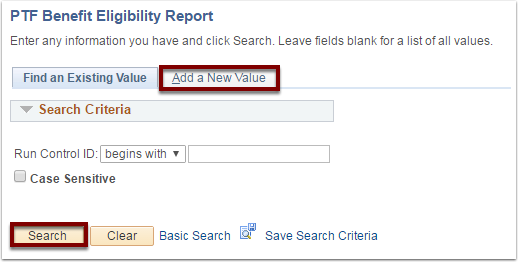 Click Search to default in a run control, or Add a New Value if this is the first run by the user for this report. Select the Company code using the lookup. If Quarter Range is chosen, a Begin Term and an End Term must be specified using the lookup. There is a check box at the bottom of the page which defaults to unchecked that, when checked, will include all jobs. The default (unchecked) only looks at PTF jobs. Use the Process Monitor to wait for the process CTC_YRQ_AE to show Success/Posted. Click Go Back to PTF History Detail List at the bottom of the Process Monitor. Click Report Manager at the top of the page. 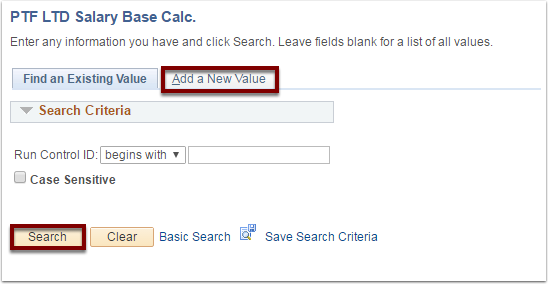 Select Company code using the lookup. As Of Date will default to the system date, change it if there is a different as of date that is of interest. Use the Process Monitor to wait for the process CTC_PTFLTDAE to show Success/Posted. Click Go Back to PTF LTD Salary Base Calc at the bottom of the Process Monitor.